Amidst the so-called “Snowpocalypse” this weekend, in which we were buried in snow and missed our Super Bowl party, we watched the musical Across The Universe several times, did a lot of sorting & cleaning, spent a couple days snow shoveling, and finished some crafting: a garland for Valentines. Inspired by Elsie’s DIY Celebrity Valentines, I decided to make something personal and pretty for Valentines. 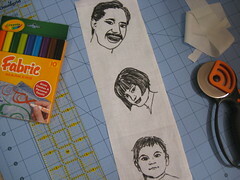 I traced photos of our family with some handy fabric markers, then ironed the fabric to set the ink, cut and hemmed them into mini portraits. 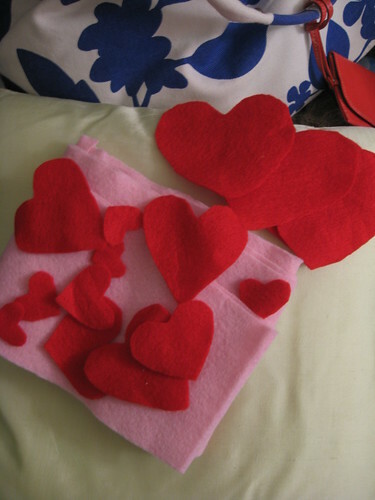 Then cut a small pile of hearts from two 8.5/11″ sheets of felt. 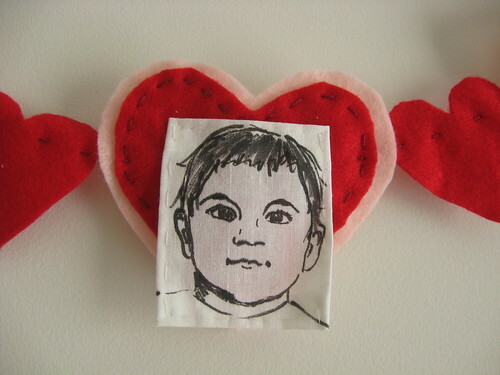 Attatch the portraits with a teeny stitch in each top corner, sew all the hearts together with a needle & some cranberry-colored embroidery floss and voila! 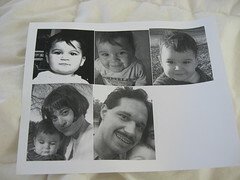 Art on the wall for now, family memorabilia for later. An easy & fun addition to my Year of Lovely Things list. Mr. P and I aren’t so sure about how our own mini-portraits turned out (I have dubious drawing/tracing skills), but we both agree that Bebe is adorable. First, I thought of you when the Saints won! Second, I think Bebe is cute no matter what, but the drawing really is great, as is the project. And third, Across the Universe is such a wonderful movie, isn’t it! I love the “I’ve Just Seen a Face” scene in the bowling alley, Eddie Izzard’s Mr. Kite, the funeral scene early on with Let It Be, the surprise of Joe Cocker….and just the visual aesthetic of it all. It’s surprisingly underrated, in my book, but warrants a double-viewing over a snowy weekend. We’re facing a snowpocalypse tomorrow, fingers crossed it comes! Bring it on, snowmageddon! I want a snow day from work. Thanks! Seriously, such a fun movie. When I return the Netflix, I’ll have to go out & buy the DVD so that it can join my small collection. That is a lovely project! What a wonderful idea. love the tracing of Bebe! Hello! Thanks for commenting on my blog. Glad to see all the lovely things you have going on here. Your knitting is sweet – the baby slippers are so pretty. 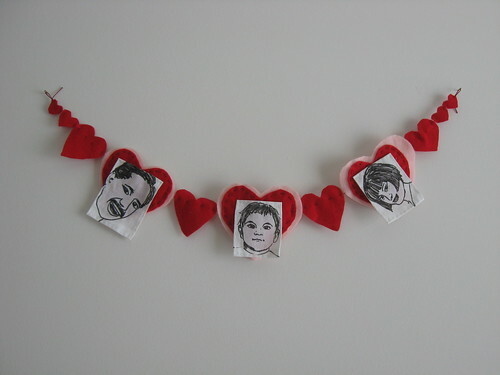 And I love your Valentines garland. I love this! Looks like something we could make in the midst of our daily hub-bub. Think I even have some red felt stashed away somewhere! What a great idea, I love how your drawings came out! I love it!!! You are one crafty momma!